Swedish manufacturer RAPID, is one of the world's leading fastening specialists. 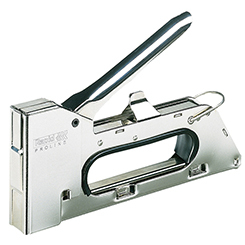 They produce stapling, tacking and nailing tools for building and construction tasks as well as renovation, decoration, repair and even hobby work at home. Long-standing in the range are their best-selling R34 & R311 Tackers, designed to be heavy-duty and aimed at the professional user for tough jobs such as roof felting, carpet laying, ceiling tiles, insulation materials and plastic sheeting. Also included in the growing portfolios are fencing pliers, glue guns and riveters. Enjoying a market share across a broad spectrum of solid, highly durable and useful hand tools that meet the high demands of the handler. It’s with no surprise that with this reknowned quality, RAPID have a loyal following. Interestingly, they’ve chosen to design many new products based on their original styles, confident the user will recognise a dependable product when they see it and prefers a brand built on tradition. With up to 5 years Guarantee on many products, why not try RAPID today and feel the difference?